The 12th edition of Signature IIJS (India International Jewellery Show) was inaugurated in Mumbai this morning by Guest of Honour Dr Subodh Agarwal, Additional Chief Secretary, Industries, Government of Rajasthan. The inaugural ceremony was attended by representatives of foreign delegations attending the show and leading jewellers from across India. 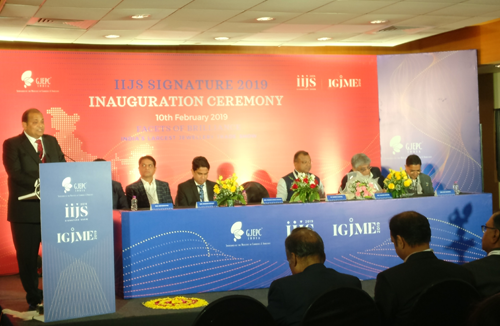 Signature-IIJS 2019 is being held along with the India Gem and Jewellery Machinery Expo (IGJME) from February 10 to 13, 2019. This year’s edition is the largest ever, with over 700 exhibitors spread over 1,350 booths. It will play host to 10 foreign delegations from countries such as US, UK, UAE, Russia and is expected to attract over 18,000 visitors from across the country. Welcoming the guests, GJEPC Chairman Shri Pramod Kumar Agrawal said that the industry had undertaken a number of new initiatives with the backing of the government and was poised to overcome some of the problems it had faced over the last year. The IIJS-Signature provided a glimpse of the strengths and capabilities of the Indian jewellery industry, Agrawal said, with exhibitors from every segment across the jewellery spectrum participating in the show. “We have been global leaders in the diamond industry for many years, and our focus now is on becoming the leading jewellery manufacturer of the world as well,” he said. The GJEPC, in association with the Ministry of Commerce has already taken a number of steps to modernise and broaden India’s jewellery manufacturing base such as the opening of CFCs in new locations and the expansion of training infrastructure,among others. Plans had also been drawn up and work has started on other initiatives such as the Cluster Mapping project, awareness programmes among MSME companies and the setting up of a Jewellery Park in Mumbai,to name a few, which together would provide a boost to the industry over the next few years. “We are targeting the creation of nearly 3 million new jobs and aiming to take our export turnover to US$ 75 billion over the next 4-5 years,” Agrawal said. In a video message to the function, Hon’ble Union Minister of Commerce &Industries, who was scheduled to be Chief Guest but could not attend due to urgent official work, said that the government has already taken an important step in strengthening India’s jewellery industry by setting up a Domestic Council for Gems and Jewellery.It was also in the process of finalising a comprehensive Gold Policy. Both these measures would surely provide a dramatic boost to the jewellery sector, he added. Shri Prabhu said that events like the Signature IIJS played a significant role in showcasing India’s capabilities to the world, and extended his wishes to all the companies taking part. On a different note, Shri Agarwal, an engineer himself, spoke about the importance of innovation is winning over consumers, and the role that technology could play in this process. He said that jewellers could win consumers’ hearts by ensuring that each piece was a unique, one of a kind creation.Existing, as well as emerging technologies, like Artificial Intelligence, for example, would open many avenues for such innovation, Shri Agarwal added, saying he was pleased to see that the industry was already using 3D printing and other contemporary technologies. Shri Shailesh Sangani, Convener, National Exhibitions, GJEPC gave the concluding Vote of Thanks.